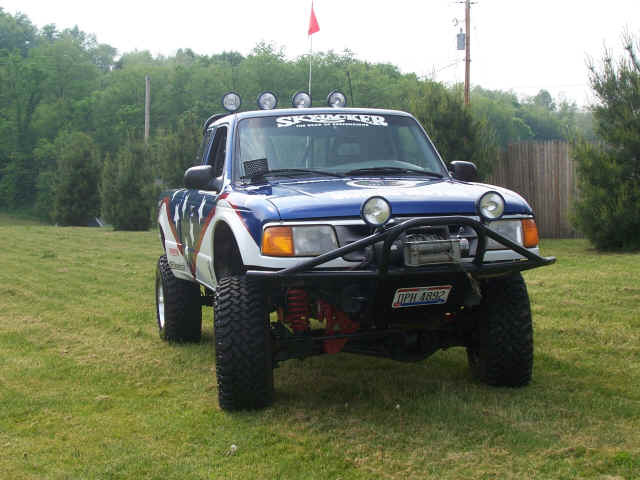 The Ranger seen on this page is my 1996 Ford Ranger extended cab 4x4. The build up of this truck came as a result of a lot of luck, and a great opportunity. During an event that I was hosting I was talking to Jim Allen from Offroad Adventures Magazine telling him that I wanted to get a group together and build another truck to see how cheaply we could build it. The discussion turned to building a capable off-road Ranger and Jim asked that I email him a list of parts that I would use if I was building a truck. It all eventually turned in to a sponsored build for a 6-part build series in Offroad Adventures magazine. Now before you start thinking how awesome it would be to have a sponsored build, I need to point out that it took several months to build this truck. It's not as simple as having someone give you a bunch of parts and then taking photos of the finished product. The bumpers and bed cage were all cut and bent by me. Everything was welded up by my friend Bob 'Ozzy' Osborn. 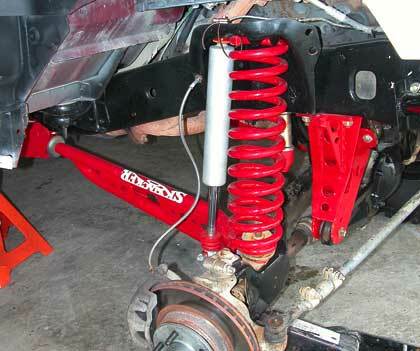 The front and rear bumpers were made from 1-3/4" DOM tubing. 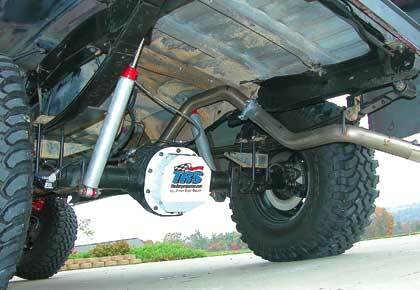 The front bumper also uses 1/4" steel plate for a skid plate and winch mount. The bed cage is made out of 1-1/2" DOM tubing. 1-3/4" DOM front bumper with 1/4" steel plate. 1-1/2" DOM bed cage with mounts for spare tire, battery boxes and bed box. Here's a look at the decal on the hood. There is a logo for each of the armed services with a POW/MIA decal in the center. The Ranger rolls on 33x12.5x15 BF Goodrich Mud Terrains. The truck was originally built with Black Procomp Streetlock wheels, but they were later replaced with 15x10 American Racing Outlaw II's to brighten the truck up some. The Ranger took quite a beating and was beginning to rust. 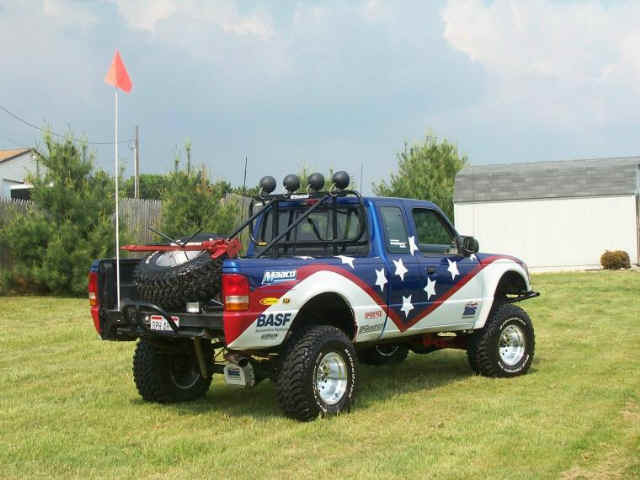 In 2010 the Ranger was repainted more in the tradition TRS color scheme, but the military tribute was retained. Some of the damage on the truck was severe, and although it looks good at a short distance, a close up inspection will reveal that I didn't bother to remove every small dent and ding in the truck. I couldn't see going through that much work just to dent it up again. Vanessa (my wife) bought me new projector headlights and clear corners. I replaced the chrome trim around the lights and above the grill to give it a new look.